The 2015 BMW M3 and M4 have a new, turbocharged inline six that's more powerful and torquey than the high-revving V8 of the previous M3. But that's not the whole story. They're also lighter, tighter and just as much fun. Here are a few things I learned from driving the two Mers at a spectacular American race course. "Come and drive the BMW M3 and M4 at Road America," they said. Road America is a long, fast, gorgeous circuit cut into the rolling hills between Milwaukee and Green Bay. A car with 425 horsepower and the proper gearing can top 150 mph three times per lap here. There's a steep, downhill 150-to-60 mph braking zone and similar gravity-fighting dives at several other corners. The force a car's rotors generate at Road America could power a Milwaukee sports bar on Packers-Vikings day. A BMW M car on a fast, heavy braking course, all day long? Cue the dramatic strings. "No, no, no. Wait," they said. "These have CARBON CERAMIC BRAKES. COME LOOK!" I did, and yes, CCBs are the difference between driving the potatoes off a fleet of M3s and M4s at Road America for a whole Tuesday, and having to stop for a shrimp-cocktail break every third lap. With the carbons, you get the six-piston calipers in the front (four in the rear). Massive stopping power and endurance. Although pedal feel turned a bit inconsistent as the hard laps piled up, there was always plenty of force when needed. And force was needed. With the standard-issue four-piston (front) compounds, it's likely we'd have had a blast on the track for about an hour or two, and then gone off to see a puppet show or something while the cars rested. Clever choice of venue, BMW. Very clever. Not that I'm complaining. Granted, the CCBs cost an $8,150 extra and require one of the $1,200 uprated 19" wheel packages (18" wheels are standard). It's a heavy expense, but an absolutely essential factory option for buyers who track their cars and would rather not deal with the aftermarket. And it's heartening to see the downward cost slope CCBs have been on for the past five years. At this rate, they should be affordable for mortals by 2019. It's true. The engine's character no longer defines the car — at least to degree it once did. I don't have to tell you the days of high-revving, naturally aspirated engines bred of motorsports development are ending. The M3/4's new turbocharged I6 — sorry, I mean S55B30 — may not have drivers joyfully chasing the back of the tach, as the V8 did, but with acres of torque and flexibility and responsiveness and (yes) fuel economy when needed, there is remarkably little to complain about. It may not have the same racing pedigree as previous lumps like the E60 M5's V10 or E92 M3's V8. But from where I'm sitting, the turbo six is a fine and competent engine, owing in part to major reductions in rotating mass, compared to the standard N55 version. Everyday usability comes at the expense of sensory responses, but the turbo six is also going to blow minds. So it's okay to let the argument rest, unless you're in the middle of a fan-forum flame war, then knock yourself out. Casual motorsports, thy name is M3/M4. It was always a shock to glance at the head-up display and see 148, 149, 150 ticking by, when nothing else in your body is saying "half way to 300." Coming out of a corner, the extra coccyx clobber at low revs gives the M3/4 a whole new, fun thing for M drivers to enjoy. BMW says 0-60 in 3.9 seconds with launch control and the M-DCT. It's probably quicker than that. We'll see. Imagine Dinty Moore beef stew, but as a sound. Oh forget it. It's fine. And maybe it'll get better when BMW turns out a new performance-package exhaust. For now, drive on, and just pretend the electronic comb-and-wax-paper synthesizer, which feeds faux-gine noise into the cabin, also provides vital anti-aging antioxidants. It's not intrusive, and at least it sounds reasonable. This isn't just a mildly tuned version of the standard EPAS now in use on the 3-Series. Albert Biermann, engineering head of M, says the betterment of this system comes down to four elements: the tightness of the front-end bits, overall tighter tolerances and a larger, lower-inertia electric motor to minimize the filtering effect that makes most EPAS systems feel numb. There's a closer connection between the torque sensor and the EPS boost controller. What's more, the system cuts out assist strategically, like when returning to center after a corner, making the unwinding a entirely mechanical proposition. It's beautifully accurate and a vast improvement in feel over some other EPAS setups (fingers crossed that a future M2 gets this gear). It's obvious M's spent time and money getting this part right, and I suspect it matches or exceeds Porsche's EPAS right now. That would be a good comparo to do. Apparently competition does improve the breed. Others have said the weighting in Sport and Sport Plus modes feels artificial. I actually thought the Comfort setting was too light, but that Sport loads up more naturally in hard cornering than Sport Plus. I'd love to see how the M engineers would set the parameters if there could only be one setting. Tremendous chassis balance. Great combination of poise and capability. A lot's been done to tighten the whole package. The rear axle subframe is bolted straight to the body, without the use of typical rubber bushings. The extra rigidity shows every time it changes direction. This is where the Ms find the magic that more than makes up for having a less "special" engine. Good work. The rear diff — an electronically activated multi plate clutch pack — introduced in the most recent M5 and M6, is remarkably quick to react, especially on the lighter M3. The accuracy with which it puts power down to maximize cornering traction makes it one of the best out there now. Come in to a corner too hot, crank the wheel and it lends a hand. Come in too slow, add power and it responds with the right amount of engagement, all the way to full lockup. Able to adjust lines mid-corner and generally get an instant re-take most corner-entry mistakes. It's like a bottle of Wite-Out for track days. MDM Seemed To Be Happier With Dampers in "Comfort"
I found the stability control, in the most aggressive setting, was slightly confounded when the adaptive dampers were set at their stiffest (Sport Plus). Setting the dampers to "Comfort," and everything else to "Sport Plus" (except the steering, in Sport) seemed to be the best setup for Road America. The extra play apparently kept all the other systems more stable. More testing needed. Please. A few of us at the launch – Mike Musto, Tim Stevens, Alex Lloyd — went back and forth a few times during the day, trying to figure out whether or not we were experiencing some sort of psychosomatic response, or if the M3 really did feel different than the M4. But yes, the M3 feels just a touch more waggly during heavy braking at high speeds, and is just a bit less responsive in changing direction than the M4. We're not sure how much higher the center of gravity is on the sedan, but it is higher. It's in no way a knock on the car's performance — I prefer the M3's extra utility — just an answer to a bar quarrel. I happen to be partial to the M3. With a narrower body than the M4, but the same track width, the aggressive fender flares give the sedan a sinister comportment. Either way, this generation of both coupe and sedan, to my eye, are the best looking M cars in years. No more "slap it on and wing it." BMW has allowed GoPro to hack into its in-car apps platform. Now, with the GoPro smartphone app acting as a go-between, a driver can control any WiFi-equipped GoPro camera from iDrive and see a preview of the camera's POV on the console monitor. The system makes recording hot laps (or insane hijinks on Russian highways) as easy as using navigation. 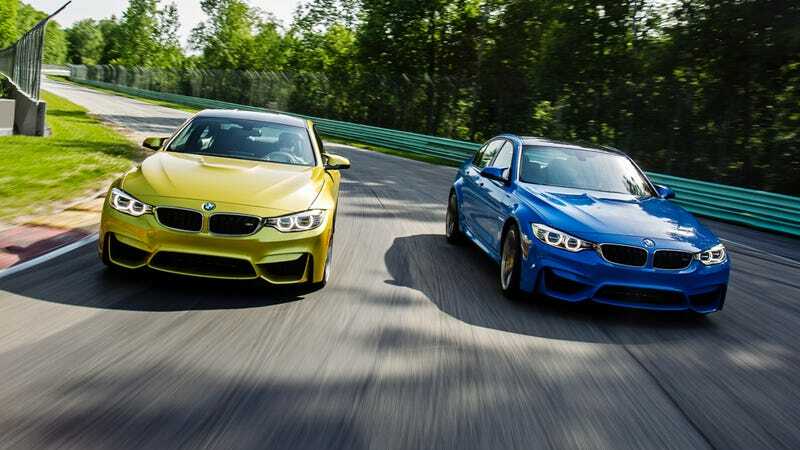 With everything you need for an M3 or M4 that can take serious track duty – the carbon stoppers and 19" wheels (required), the adaptive dampers, the M-DCT — expect to pay around $76,000. (Base prices with destination are $62,950 for the M3, $65,150 for the M4.) You can of course cut the price by $2,900 and get a six-speed manual. You'd be happy with either one. Nav comes standard, but if you want the head-up display, you have to go for the $4,300 executive package.